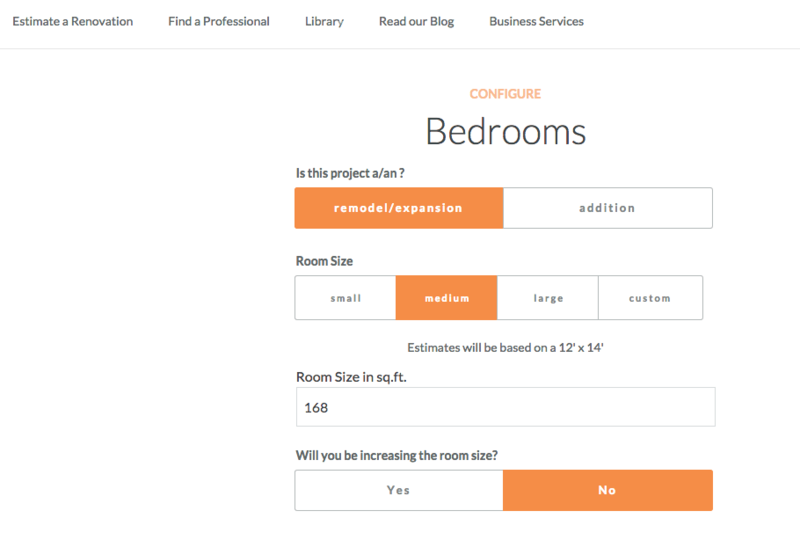 My sister is about to remodel the spare bedroom in her home, so I thought it was the perfect time to test out Kukun (as in “cocoon”), the home-renovation platform that lets homeowners estimate the cost of renovations and find professionals to help. I’m not quite sure what she’s actually having done, so I tried a few different combinations. The process involved signing up with my email and starting in with the estimator tool. The first page asked if the renovation would be indoors, outdoors, or energy-efficient upgrades. Room choices include bedrooms, bathrooms, kitchens, sunrooms, pool rooms, and hallways (but no basements). I chose one bedroom and moved on. Next, I had to pick my finish level: good, better, and best. The good “includes flooring, light fixtures, paint, sweet dreams, and hardware” and doesn’t require a permit, while better and best involve HVAC, electrical work, and, thus, permits. Moving on, I said it was a remodel, not an expansion, and entered the room’s dimensions. I checked (or, in reality unchecked) boxes to indicate what the remodel would involve (no demolition, lighting, or drywall work, but there will be paint, flooring, and trim updates). Next I chose between “good, better, and best” on each individual task (with breakdowns explaining how each option differed), then entered my sister’s ZIP code to get a quote. Unfortunately, “no professionals were found near the address provided,” but I did learn that selecting “better” paint, flooring, and trim will set my sister back $3,042. The quote didn’t break the cost down any further. (For example, I don’t know how much of that is the paint versus the flooring). “Through our estimate tool, Kukun uses the same data that construction companies use yearly to determine their pricing, thus providing homeowners with a reference of price,” Raf Howery, co-founder and CEO of Kukun, told Digital Trends in an email. “It’s like the Blue Book for cars but for renovation.” The company aims for its estimates to be 80 percent accurate. If you do find professionals in your area, they should have a “Kukon score,” which should tell you how reliable they are, based on reviews. One flooring expert in Portland I found has a score of 77 out of 100, which seems based on a single five-star Yelp review. Even without that professional-finder service, though, Kukun’s estimator tool might prep you for the sticker shock of dealing with actual contractors.